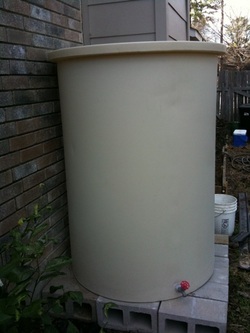 This is my 300-gallon rain tank I ordered from www.plasticstoragetanks.com. I had gutters installed on the back side of the house and routed the downspout to the tank, so every time it rains I get 300 gallons of soft, chlorine-free water. I think 1 inch of rain on 1,000 square feet of roof is ~600 gallons. I keep a sheet of window screen over the top to keep out mosquitoes. Blueberries need acid soil and soft water, and they hate our alkaline city water. I have 8 blueberry bushes in 30-gallon pots nearby. To irrigate them, I would just fill up a 5-gallon bucket with rainwater and go. However, it takes a long time to fill up a bucket 8 times. The water pressure isn't that high, and it could take up to 30 minutes to water all the blueberries. So I built a home-made drip irrigation system. I got a free electric submersible pump from work. The pump was 12-V DC, so to run it I had to find a way to convert from AC to DC. I was able to do this by scavenging the power supply from a Nintendo Game Cube I don't play anymore. I ran the wiring from the Nintendo adapter into a timer switch, and then connected the pump. Success!.....almost. I watched it pump out a steady stream of water, and then disconnected the pump, satisfied with my handiwork. The pump worked great, but I forgot about siphoning. While I went inside to play with Joe, all 300 gallons of precious rainwater continued to siphon out of the tank into the yard. By the time I realized what had happened, the tank was dry. The little electric pump didn't have a shut-off valve so when I shut the power off, the impellers stopped turning, but the pump was still open. Fortunately, I was able to get a cheap PVC check-valve at Home Depot, and that took care of the problem. I buried a 1/2-inch plastic line over to the blueberries, and then made a simple manifold out of plastic tubing and teflon fittings. Then I ran 0.17-inch drip tubes into each blueberry pot, and tested it. Everything worked great! My initial test with the timer showed that each pot receives approximately 1 gallon of water every 5 minutes, for a total output of ~1.6 gallons per minute. Now I just go turn the dial to 20 minutes twice a week, and the blueberries get good quality water. I finally upgraded to a 1,000 gallon tank, so now I can irrigate my blueberries with rainwater through up to three months of drought.